While it is the summer now, much chillier winter weather is only a few months away. Age UK Waltham Forest is looking for volunteer knitters to create little hats that will help raise vital funds for to help local older people fight the freeze this winter. 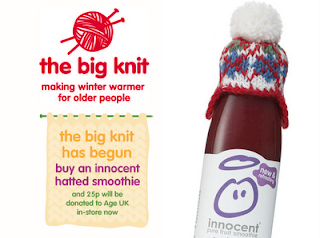 Mini hats for innocent drinks’ bottles will be knitted by local older people and each one sold will raise 25p for Age UK Waltham Forest. Age UK Waltham Forest need help to knit 6,500 little hats – why not have a go? 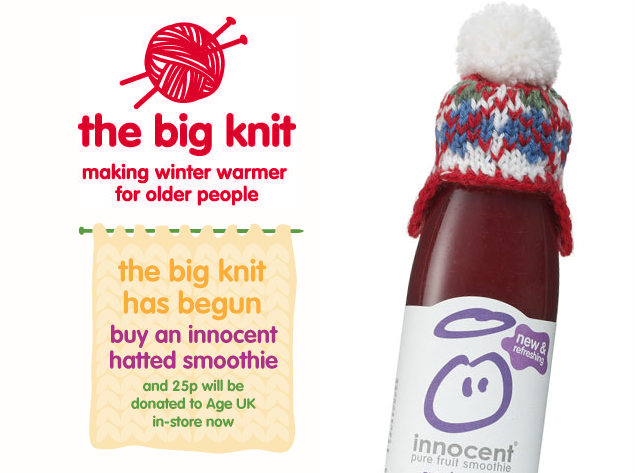 You might find one of your little hats on a bottle of Innocent Smoothies in your local Sainsbury and Boots store! We do that you will be able to take part in this campaign, should you wish to, a copy of the simple pattern is attached. 1. Tune in to Radio 4 – or any favourite radio station!! 2. Using double knitting yarn and some small needles (3 1/4mm or 10), cast on 28 stitches. 3. For the first two rows knit 1, purl 1 to end. row). If you can, experiment with as many different patterns, colours and stitches as you like. row (giving you 14 stitches) and then purl together to the end of the row (giving you 7 stitches). 6. Cut the yarn thread at about 25 cm and thread it through a sewing needle. Thread the needle and wool through the remaining 7 stitches and remove the knitting needle. Tighten the thread and sew the little hat together at the side. Once finished, turn it inside- out so that the seam you've just sewn runs up the inside. 7. OPTIONAL Sew a little bobble onto the top of the hat. You can either make them or send in the hats without. Please send hats in by Monday 8th August 2011. We are not asking people to stop knitting in August – this is merely so we can assess numbers and ensure we aren’t under or over target.